Not to be confused with the lime you find in your local produce store, Lime is a commonly used chemical for wastewater treatment and can be slaked when water is added and turned into slurry. The use of lime in its various forms has been steadily on the rise. 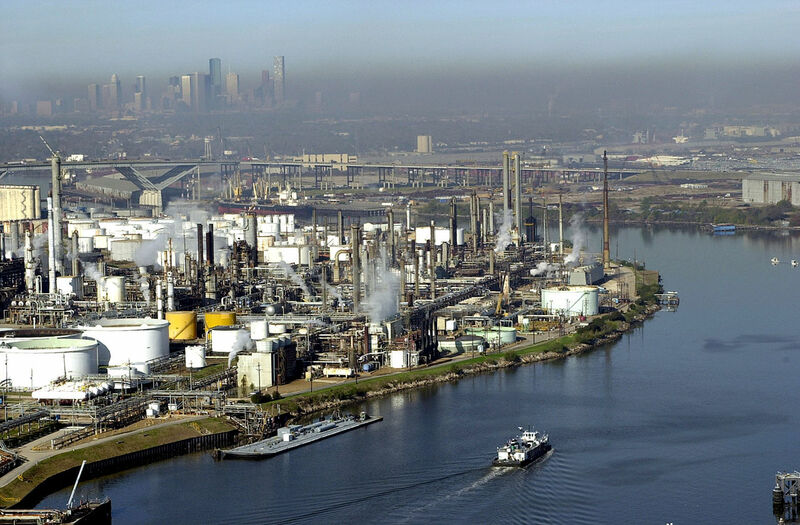 Today lime is the most important chemical used throughout the world for pollution control. It is, therefore, imperative that handling and processing lime be well understood by all those who use this chemical. The Lime used in the water treatment industry is referred to as either quicklime (CaO) or hydrated lime (Ca(OH)², which is hydrated in a slaking process before it’s used for chemical coagulation, precipitation, pH adjustment and chemical stabilization of sludge. Why is Lime Important in Water Treatment? Aside from being a far less expensive treating agent, lime has the ability to increase alkalinity of a poorly buffered water as well as the controlling the growth of bacteria in aeration tanks. This process, also called ‘excess alkalinity treatment’ has the additional benefits of removing manganese, fluoride, organic tannins and iron from water streams. Lime is suitable for use as sludge stabilizer, as well as sludge conditioner for industrial and domestic waste activated sludge. When sewage sludge is removed or sent for further dewatering, lime and ferric chloride are used as filter aids to condition sludge for final clarification of the effluent. Quicklime or calcium oxide (CaO) may be employed during the water Neutralization process carried out in either batch or continuous mode. In batch mode, the effluent is retained until it meets pH qualitative specifications before release. Lime helps balance the excess acidity or alkalinity in water and can help adjust the pH of water, depending on the target pH and process – caustic alkalinity is absent if the pH of the water is below 10, and carbonate alkalinity is absent if the pH is below 8.3. The quicklime compound purity varies from 75 to 99% calcium oxide. 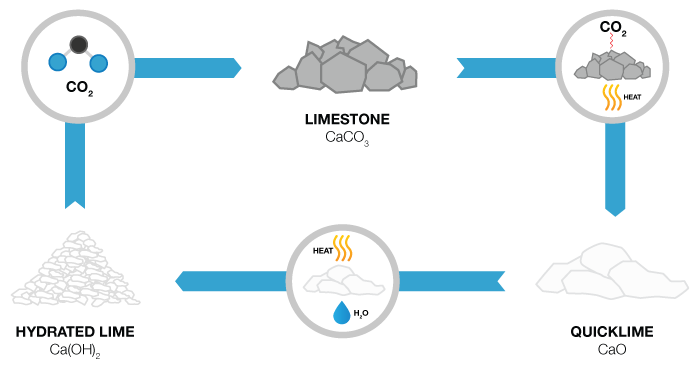 Both pure quicklime and dolomitic quicklime have a strong chemical affinity to absorb water. The slaking of quicklime requires 15 – 30 minutes under optimum conditions and it should be conducted rather carefully, ‘as the success of the water treatment depends to great extent on this process. Hydrated lime, also known as calcium hydroxide lime (Ca(OH)², is available in white powder form and can be mixed directly in solution tanks and employed in dry form. Hydrated lime is commonly used as a primary coagulant for the treatment of industrial waste streams and contributes to the clarification of water. It is also suitable for use as sludge stabilizer, as well as sludge conditioner for industrial and domestic waste activated sludge. The benefits to using hydrated lime over quicklime is that it doesn’t dematerialize in tank storage, it doesn’t have to be slaked and contains fewer impurities than most quicklime – usually between about 80% and 99% is pure calcium hydroxide lime. Because hydrated lime can be easily handled, smaller water treatment purification plants prefer using it over quicklime to supply additional alkalinity to the water. As the calcium hydroxide formed by the slaking process is only slightly solvable it is necessary to agitate the contents of the tank continuously to maintain a uniform suspension. Too little agitation results in uneven temperature within the slaking chamber resulting in hot and cold spots. The hot spots will result when slaking temperatures are over 212°F. Slaking at these temperatures will result in hexagonal crystals of large size and reduced surface area and agglomeration of particles and cold spots will result in either drowning or un-hydrated particles of CaO. Mechanical agitators capable of providing vigorous agitation are used to maintain uniformity. What Are Common Lime Slaking Problems & Protocols? Lime in general has many advantages but there are some issues that occur with lime slurry feed systems such as clogging of metering pumps and inlet valves and incrustation of pH probes. This happens due to the wear and tear of continuous usage or malpractices and handling during slaking. To prevent or minimize “caking”, rotary cup type feeders or similar slurry feed systems should be used instead. The problem of malfunctioning pH probes can be circumvented by routinely cleaning the probe and possibly alternating between various probes so that fouling or failure doesn’t occur during the process. Also instrumentation panels adjacent to the slaker are often exposed with lime dust and grit that overtime slow or breakdown equipment. These instrumentation panels should be stored away from the slaker to avoid this problem. Another thing to consider is that during slaking of lime, if the slaker is not operated under negative pressure steam and condensation travels back into the feeder and lime tank resulting in lime accumulation problems. It is important to note that incorrect lime slaking temperatures and ratios of water to lime can cause poor quality hydrated lime and condensation issues that contribute to caking and pipe clogging. When slaking at high temperatures around the boiling point of water, hot spots can develop within the slurry, which will cause hydrate particles to crystallize and agglomerate forming larger flat particles with reduced surface area. This problem is more likely to happen in paste slakers since they operate at higher temperatures and in the areas where vigorous mixing is not required. Lime slakers should be air-sealed and operated under negative pressure and the utilization of fans to expel vapors and retain negative pressure in the slaker should be considered. Uneven mixing of water can produce explosive boiling conditions and splattering of lime slurry. The general formula used is: Incoming water temperature + heat of reaction = final slaking temperature. W = weight in pounds of slurry per cubic foot. S = specific gravity of dry lime solids. A = per cent water in slurry. CW = Concentration of solids in slurry, by weight. Slurry viscosity varies dependent on hydration conditions. Viscosity increases at slaking temperatures of 180°F and above. The relationship of viscosity, particle size, and specific surface is not completely researched. In general it is presumed that higher viscosity means smaller particle size of hydrate and greater surface area. Variations of viscosity of hydrated lime slurry have been reported between ranges of 45-700 centipoises. How to Safely Move & Handle Lime? Transporting lime particularly loading and unloading can cause lime dust accumulation and installing dust collection bins will eliminate lime by-product. While slurry can sometimes be treated as dense and highly viscous liquid, the particle size and distribution create additional problems. During transportation of lime there can also be damage of lime passage piping due to abrasion at sharp elbows and bends – long radius piping should be used instead. In extreme cases, lime batch tanks can rapture due to excessive pressure build-up so pressure relief valves should be installed as a preventive measure. Lime slurrying abrasion problems in mixing tanks can arise from the types of tanks that are used; most cases of abrasion occur when Fiber Reinforced Plastic (FRP) tanks are used for slurry preparation in which corrosion resistant metal tanks should be used instead. Scaling in lime slurry piping is caused by escape of air into pipes (formation of calcium carbonate) and settling of solids during off cycles especially when smaller diameter slurry lines are used. Needless to say cleaning scale in pipes can be very labor intensive particularly in metal pipes. This problem can be minimized by recirculating the lime slurry through a “re-circulation loop”, using flexible hoses for slurry transport inlet lines, minimizing the number of sharp bends using piping at least one and half to two inches in diameter and periodically flushing the lines with water. Keep in mind that even using larger diameter lines to lower pressure drop will cause settling of the solids and slug flow so the easiest way to design a pipeline is to maintain non-settling conditions, similar to the design of dilute-phase pneumatic conveyors. 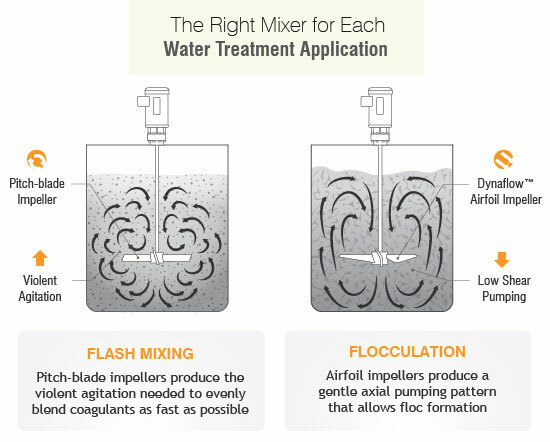 How to Slake Slurry with The Right Mixer? In slurry the shear force caused by mixing or filtration can impact how the components of the slurry behave. The most negative influence is when shear makes the particle agglomerate with itself or other slurry components causing the slurry to congeal (or gel) or increases settling of the particle out of slurry. For example, if the slurry isn’t premixed, the slurry may have some or all of its abrasive content at the bottom of the tank, resulting in batches with higher solids and others with lower solids from subsequent batches as the tank is drained. Proper mixing configuration and process understanding can control this. A common mistake is to select a small or incorrect impeller with low or uneven axial flow patterns can cause fluid stratification and solid settlement. This is most common in tank corners that subsequently will require scraping after solidification. Normally, the types of slurry that settle are not shear sensitive, so an aggressive mixer speed and impeller type is recommended. The best impellers for slurries are our P3B Pitch Turbine, or P4-bladed/45° pitched turbines, or in some cases a Dynaflow® hydrofoil impeller. While an impeller can handle a variety of services its functionality isn’t limitless and other factors should be considered. 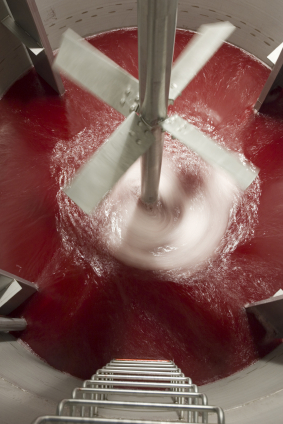 However, agitators and impellers aren’t a one –size-fits-all solution so the appropriate mixer selections must be made dependent on process optimization and complex particle property requirements and water treatment stages. The selection of an agitator for lime slurry requires a balance in power consumption, shear rate, laboratory scale up studies, suspension efficiency, whether it’s a batch or continuous system, vessel geometry and type of water. All the above factors determine the best agitator for the maximum quality control at every stage. In conclusion, Lime has incredible value in terms of its chemical usefulness and water treatment properties. However, operational best practices must be considered; how to use lime such as facilitating proper slake mixing conditions and combination ratios, ensuring the utilization of proper reinforced tanks when working with high-temperature situations during mixing and the selection of the proper mixing solution.